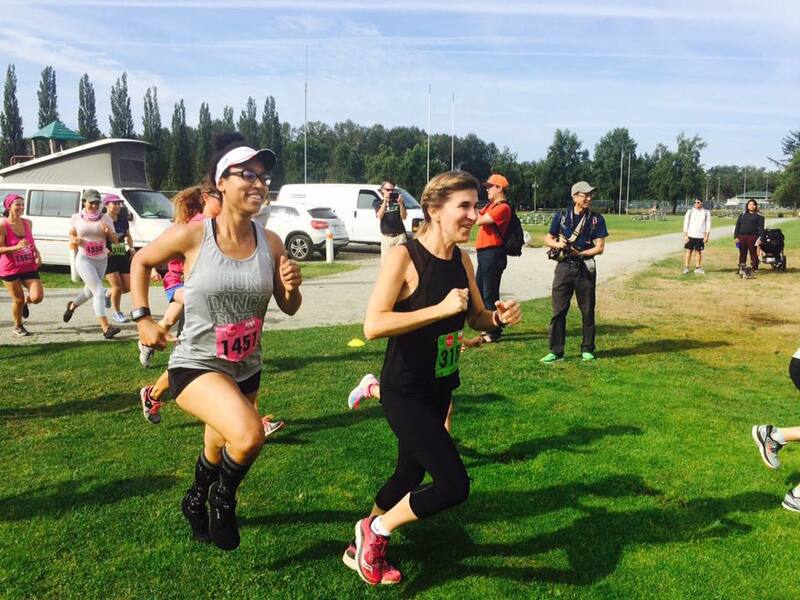 When I came back to running after a pregnancy and maternity break of about 9 months, my speed was no longer there (see my blog post ), so I chose to sign up for a race that would test my endurance instead. The problem was that I was never a fan of long slow runs, especially in the rain. I found them boring. Also, as a parent with another job on top of parenting, I did not feel like I had too much time to spare. 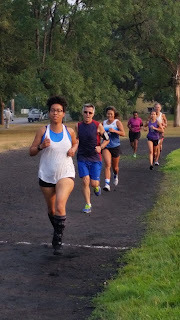 So, I did some research and worked to design a 5k-to-half program with the lowest mileage possible for me. 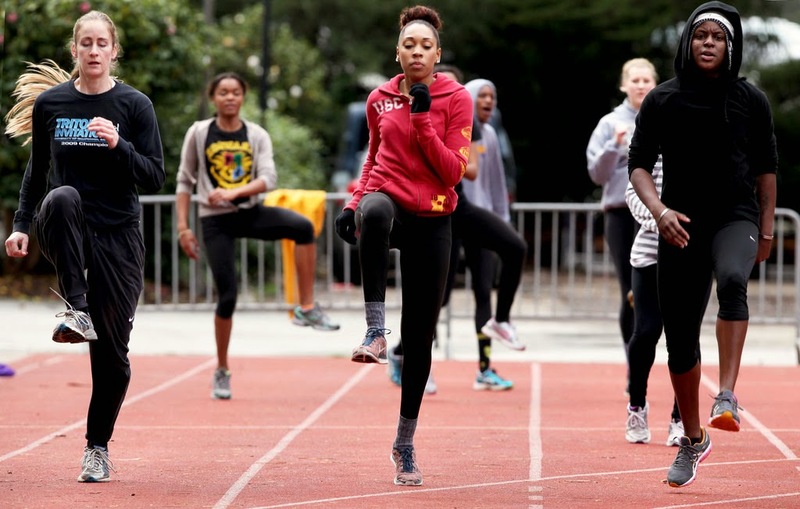 One thing that all coaches seemed to agree on was that if one hopes to race well on lower mileage, then the training intensity needs to be on-point for each workout. It is hard to give your best when training alone, so it was important for me to have specific goal paces for my workouts. To help with motivation, I shared them with friends on Facebook. Using recent race times, I established goal paces for the following 3 weeks. Increasing long runs to 10k. 3x per week with a focus on my hip stabilizers, feet, and core. 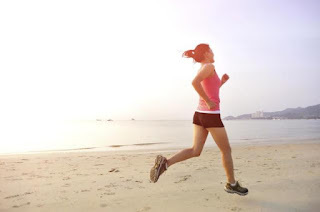 Running workouts focus for week 3-4: increasing long runs to 13k and improving mile time trial results. 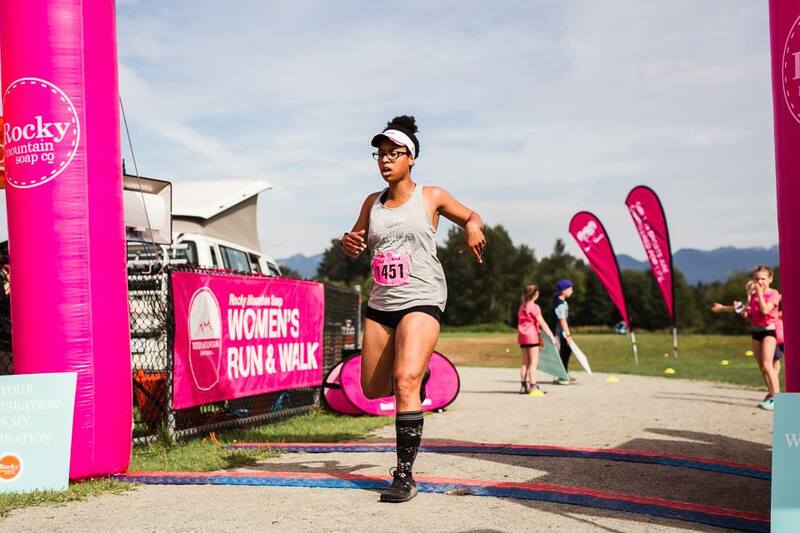 I found out about this fun Mile race in Squamish that was on the same day as a Loggers Parade and Loggers Sports Championship. It was too perfect of an opportunity for a fun family weekend to pass. Doing the mile race meant that I would have to wait until the next 4-week cycle to achieve my long run goal of 10k. I, and most of the other runners, ended up getting lost and running a lot more than a mile. To make things worse I had forgotten to charge my GPS watch. Because I kept hoping that the finish line would be somewhere ahead of me, I kept running until I saw the teen boy who was leading the race turn around saying he had passed a 2k marker for the 8k race. I must have run something close to 3k myself, but will never know how fast that Mile was. I signed up for a 5k race as a 5k time trial would give me more accurate goal paces for my workouts. 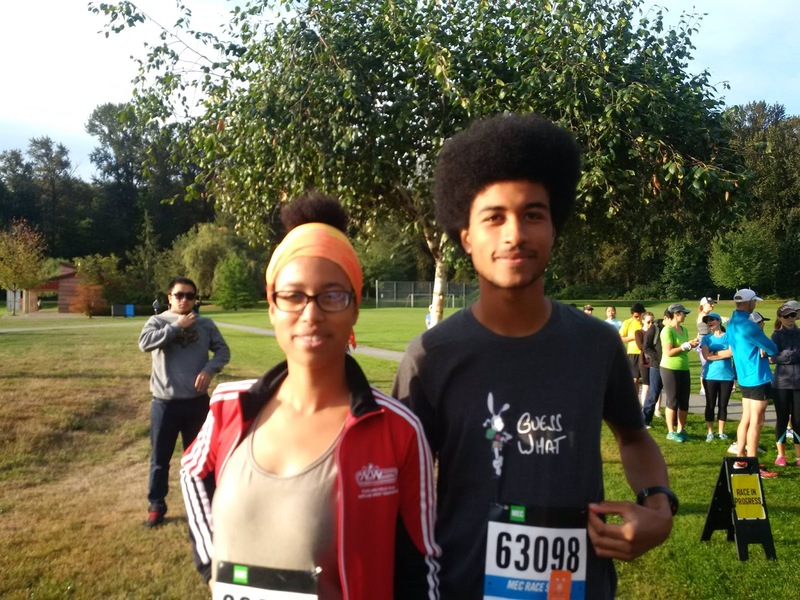 I also signed up to participate in the new and exciting North Van Run 5K & Kids 1K with a runner I was coaching at the time and my daughter who was now walking. I was happy to be able to not only achieve my goal of running a sub-25 5k but to also end up with a time a full minute faster than my goal. I calculated new goal paces based on this result. My brother was visiting me from Europe, so I did not get to train as much, but we did a few fun track workouts while he was there and my little one practiced her walking with us too. I also signed us up for a 10k race organized by MEC. This is where the mentally tough part starts: I have this weird relationship with running in that if I do not have a little bit of pain to keep me company, I get bored. I will need to figure out a way to overcome that challenge if I am to finally go over 10k. I decide to find and download podcasts as a way to help. The 12k was on a hilly course (the main street in my neighborhood is a bit of a rollercoaster) as I was too scared to run on my own on quiet streets on a Sunday morning. Listening to a podcast for the first half helped a lot in motivating me by keeping the boredom away. After that, my old friend "pain" joined the run, so focusing on battling it and keeping good form was enough to keep my mind busy for the last 5k. I ended up feeling quite good at 6k and went a little further than first planned. As it was an out-and-back run away from and to home, so my total distance ended up a bit longer than planned. The extra 1.5km after 12km ended up being shuffle-walk intervals. This run was also the first one ever where I got to experiment with drinking and fuelling on the run. I opted for an energy gel after 30 minutes of running and a few sips from a bottle attached to my fuel belt every 15 minutes after that. It worked great for all my long runs, so it was the strategy I picked for the race. I was surprised by how good I felt after my 14k. I was worried I would feel very sore after 12k because that was how I felt after my last 12k. However, I did run 13k split between two consecutive days one week ago. 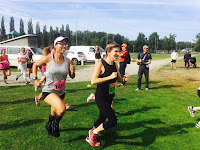 I was glad to see that my body was able to make the required adaptations after a split long run: I did not feel like my legs were stiff until after 13k. My real struggle now is to get some good tempo workouts in. I have yet to have run at tempo pace for over 3k outside of a race! This issue comes from a mix of a lack of time on weekdays (I often do my runs as run-commutes wearing a backpack at the end of the day) and motivation to run fast when alone. That was the week when I learned that my goal race, the Fall Classic, was sold out. The other half-marathon road race I could do before the winter, the Mission Half-Marathon would be two full weeks earlier. I decided to take advantage of what seemed to be a quick adaptation to long run mileage increases and to do 17k for my next long run. Long Run: Goal was 17k with 5k at tempo pace. I ended up running 18k in total with the cool down. Tempo: 8k (5:40 per km) mostly done on a track. 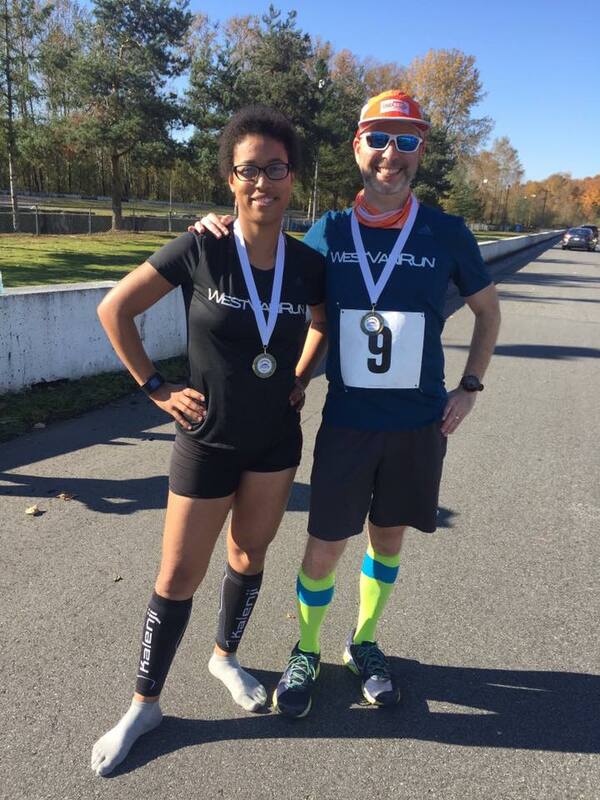 The Mission Half-Marathon is very different from the Fall Classic in that it is a lot flatter, and requires racers to run 10 laps on an auto raceway to complete the distance. 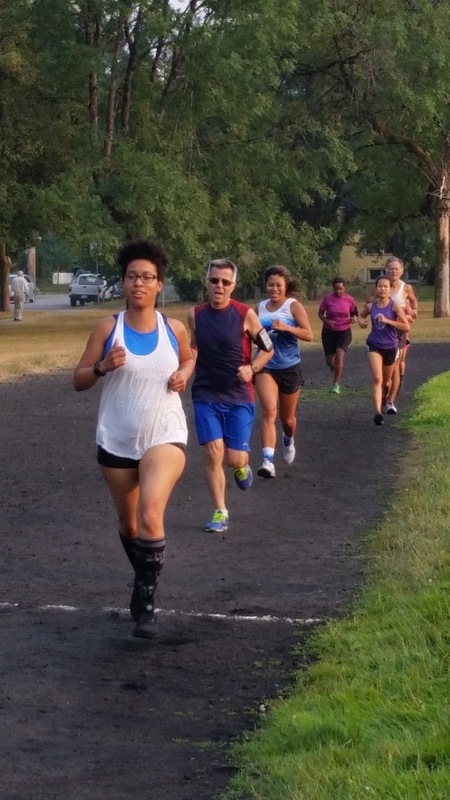 I had to include more laps running in my training to be better mentally prepared. I finished my long run on the track and included 5k at long tempo pace (around 5:40 per km) on the track to build some mental strength and the capacity to keep a good pace on tired legs. Because my first half ended up being two weeks earlier than planned, I did not get to run 19k before the race. This got me worried, but a few friends told me that running 18k was more than enough to be ready to run 21.1k. 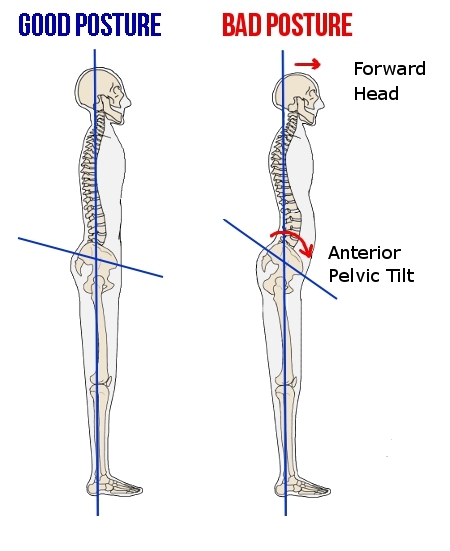 Walk on Thursday and Friday: I find I take longer than what most training plans expect to fully recover before a race. 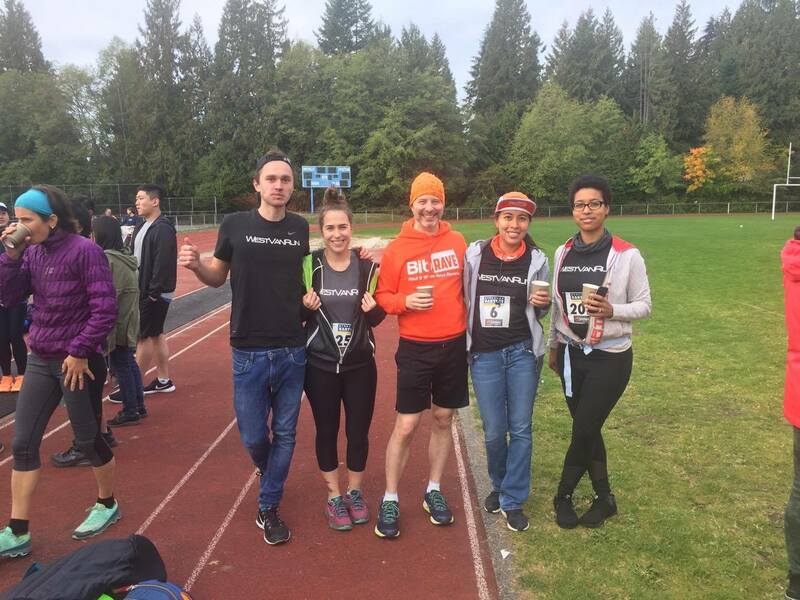 The Mission Half Marathon was a lot more fun than expected and it had a lot to do with the great company of Bradley, Tibor, Kristin, the amazing volunteers, and friendly competitors. Quite a unique race on an auto raceway that is worth the try. 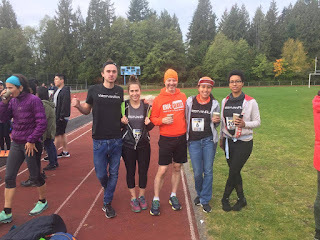 It was as flat as can be in the Lower Mainland and having a water and Gatorade station available every lap made it possible to run without stressing about hydration. 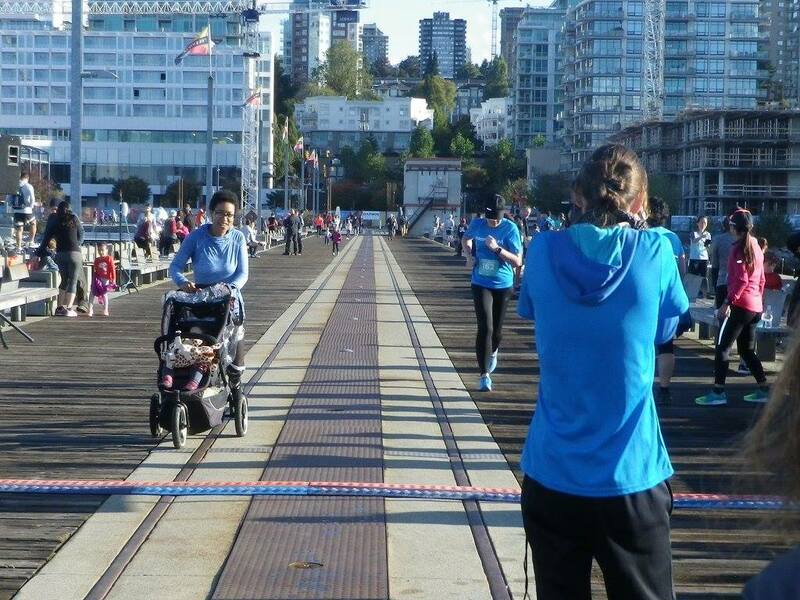 I entered the race with no specific goal pace but secretly hoped to be able to break 2-hours. I started the race at a pace that seemed relaxed to me, then looked at my watch to see if I was going too fast. I did not have a goal pace, but I had a pace I knew I should avoid running faster than if I wanted to finish the race running. I was running a little bit faster than that pace. I decided to relax a little more and then felt comfortable at a pace that, if I could maintain it, would definitely get me to finish under 2 hours. Bradley ended up running at a pace close to that as well, so I just focused on staying close to him. Because I had trained with energy gels and water, I consumed my own energy gels and took sips of water only from the aid station. When I started chafing under my arms, the water also helped calm the fire. 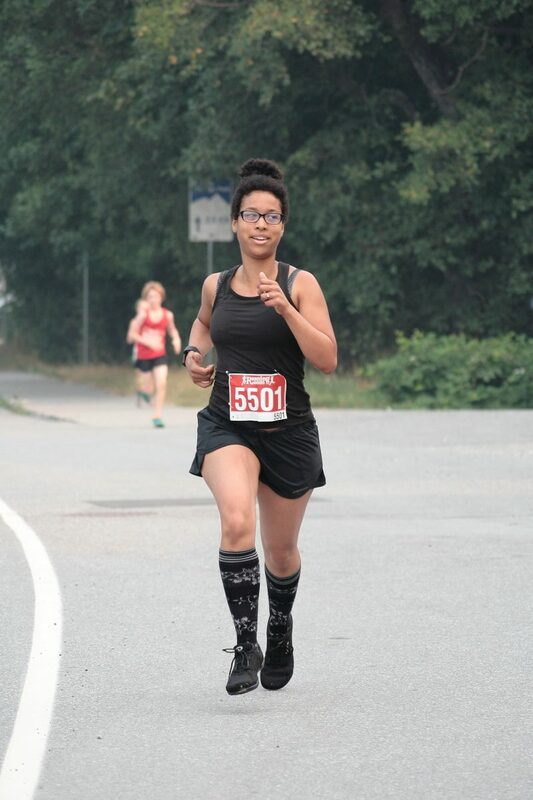 Once I hit 17km, I let the competitive runner in me take over. 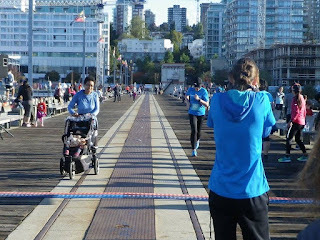 I started pushing to avoid any other female runner catching up with me and to try to catch up with the ones ahead of me. In the end, I still had some energy left for a final hard 100m sprint to the finish line.